Meathead Movers is here to take care of your heavy lifting, with the help of our professionally trained, student-athlete Pinole movers. When it comes time to move, we'll help you get safely settled into your new home. Welcome to Meathead Movers of Pinole! Whether you’re on the move to or from Pinole, our professionally trained Pinole movers and moving concierge service are here to help you with every stage of your move. On the shores of San Pablo Bay, the small town of Pinole is the perfect retreat from busy city life. It is the ideal town for those looking to be close to the city, but still wanting a quiet and peaceful place to call home. Residents can visit Old Town Pinole for specialty boutique shopping or Pinole Vista Crossing and Pinole Vista for other big name brand shopping. Also with plenty of parks and trails to explore, there are many opportunities for people to get out and enjoy Pinole’s natural beauty. 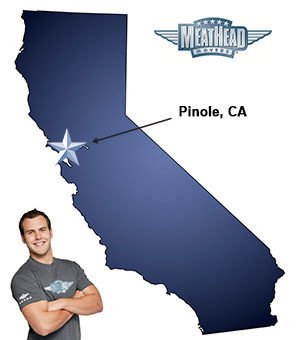 If you are considering calling Pinole home, Meathead Movers is here to help. Our experienced Pinole movers specialize in all aspects of moving, starting with packing or storage and including local and long-distance moves. We can also be contracted to conduct on-site relocations and any number of commercial moves. All of our Pinole movers are thoroughly screened and trained before their first move. With branches not just in Pinole, but all throughout the Western US, Meathead Movers is your one-stop resource for all your moving needs. We have been revolutionizing the moving industry since 1997. When you entrust your move to Meathead, you can rest assured knowing that your move will be a success. Our professionally trained student-athlete movers are the best movers that the industry has to offer. In fact, you can see what the people of Pinole have to say about us! With our 100% satisfaction guarantee, the only thing you have to lose is the stress that comes from moving! Contact Meathead Movers today for a free moving quote and learn how we can help you on your next move! Moving to Pinole? Here are some helpful resources.